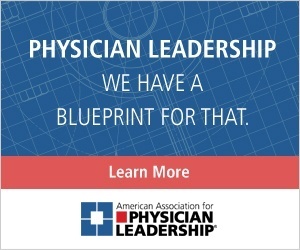 A pharmacist-led collaboration with physicians goes into the heart of a community that would benefit most — and had a positive effect. 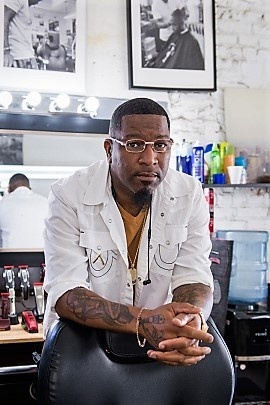 Amid the buzz of hair clippers and the beat of hip-hop, barber Corey Thomas squeezes in a little advice to the clients who come into his Inglewood, California, shop for shaves and fade cuts. Watch what you eat, he tells them. Check your blood pressure. Don’t take life so hard. And that can be good for their health. Thomas, who himself has high blood pressure, helped lead a group of customers as part of a study published in March 2018 in the New England Journal of Medicine showing that providing information and inviting a pharmacist onsite can go a long way toward helping black men reduce their blood pressure. The group, which met for about a year in 2016, included a once-a-week visit from the pharmacist, who prescribed blood pressure medicine and followed up with the customers to make sure they were taking it. A blood pressure machine installed in the barbershop sent patients’ readings directly to their doctors and to the pharmacist. 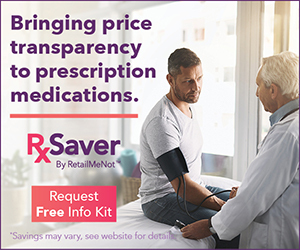 Researchers found that after six months, the men who received both the education from their barbers and the drug therapy from the pharmacists were more likely to see their blood pressure drop to a healthier level and remain under control than the comparison group that received only information and encouragement to see their doctors. Nearly two-thirds of the men who got the drug therapy achieved a healthy blood pressure of less than 130/80, while only about 12 percent of the second group did. “We all expected the intervention to be effective, but I don’t think any of us could have predicted the magnitude of the effect we ultimately saw,” said pharmacist Ciantel Adair Blyler, one of the co-authors of the study, who visited 10 barbershops in Inglewood, Compton, Bellflower and Long Beach. She went to each shop once a week for a year to see patients, she said. A team of pharmacists, along with physicians from several medical centers in Southern California, conducted the study at 52 Los Angeles-area barbershops with an $8.5 million federal grant from the National Heart, Lung, and Blood Institute. Each of the 319 barbershop clients in the study had hypertension, defined as an average systolic blood pressure of 140 or higher. They were randomly assigned to an intervention group or a control group. Uncontrolled hypertension is one of the biggest health problems facing the African-American community, health officials say. It affects blacks more often, and at an earlier age, than whites and Hispanics, according to the federal Centers for Disease Control and Prevention. About 43 percent of black men have high blood pressure, compared to 34 percent of white men and 28 percent of Mexican Americans, CDC data show. According to the CDC, stress related to racial discrimination, mistrust of the medical system and less frequent use of health care services and medications, are some of the reasons why African-Americans are more likely to have high blood pressure. Stress related to racial discrimination, mistrust of the medical system and less frequent use of health care services and medications, are some of the reasons why African-Americans are more likely to have high blood pressure, according to the CDC. Undetected hypertension can lead to heart and kidney damage as well as strokes and heart attacks. Blyler said she and the team understood the mistrust, which is why they chose barbershops, traditionally a common venue for community gatherings in black neighborhoods. But there were still some challenges gaining the trust of the barbershop patrons, Blyler observed. “The hurdle we had to get over was getting them to trust me, to trust that the medication I was prescribing was good for them, that it wasn’t an experiment and I wasn’t somehow financially benefiting from drug companies,” she said. The Los Angeles study was led by Ronald Victor, a cardiovascular physician at Cedars-Sinai Medical Center, who secured the $8.5 million grant to study the area’s black-owned barbershops. 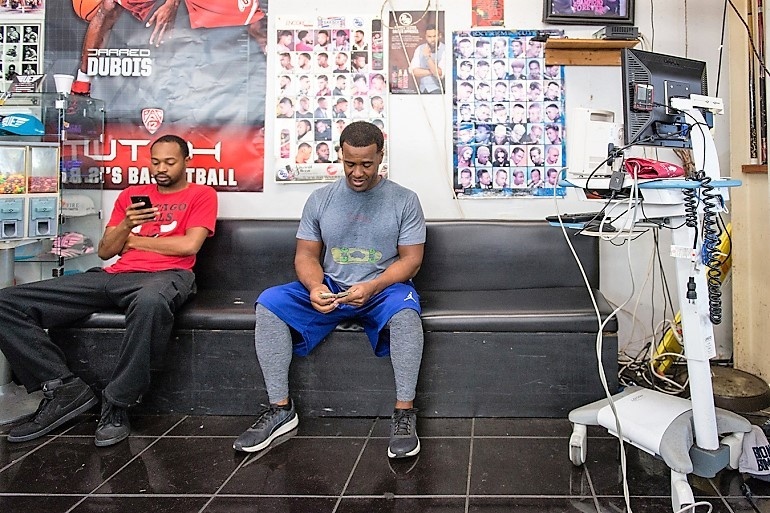 Thomas, the barber at A New You, agreed to participate in the study and help his clients check their blood pressure. Thomas, 49, who had suffered a stroke six years before, said the pills he was taking made him feel sluggish. The pharmacist assigned to A New You was persistent. “They asked me about my lifestyle, how I ate and everything — as opposed to my doctor. He didn’t ask me nothing,” Thomas said. The pharmacist changed his medicine, the blood pressure machine was moved in, and Thomas — as well as his patrons — started to listen. With a little golf he plays now, and some changes in his diet, Thomas said his systolic blood pressure is down to 129. “I feel great,” he said, adding that “it’s also fulfilling” to help his customers control their blood pressure as well. Even though the study is over, Thomas still talks to his customers about hypertension. And the blood pressure machine is still there for anyone to use. Thomas said efforts like these can help change long-ingrained habits among African-American men. This story originally was published on March 12, 2018, by Kaiser Health News.